You may have guessed by now as a reader of my blog, but I quite like beauty products, and I also love a good pamper. A chance to have some time to myself and be looked after for a hour or so while someone does my hair or my nails, is my idea of heaven. I often set aside an evening once a week to give myself a good pamper; use a face mask, a hair treatment and paint my nails, it helps me to relax and unwind. It’s even more of a pamper when someone else can do this for me, but it’s a rarity that I can get a chance to visit a salon or get my nails done these days, but when I can it’s a real treat. 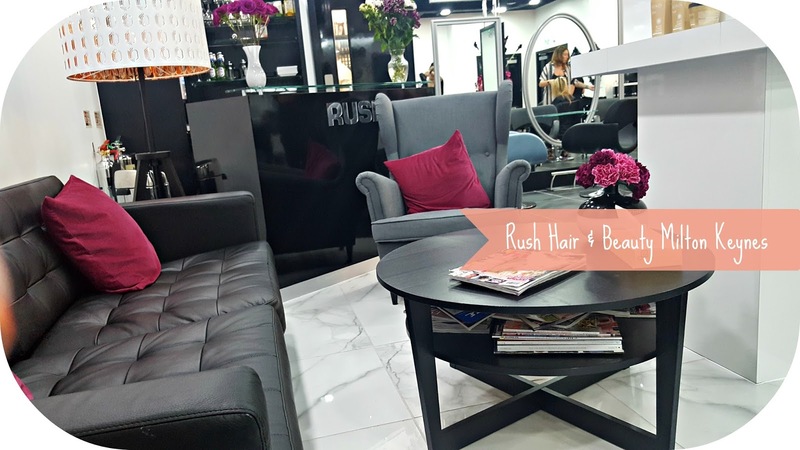 Recently I was invited to Rush Hair & Beauty‘s new salon in Milton Keynes for the chance to try out the salon, and be treated to a cut and blowdry. With my hair in bit of a dry, dull state, I was looking forward to having someone who knows what they are talking about work some magic on my hair, and hopefully make it look less, meh. Rush Hair & Beauty’s Milton Keynes branch is located within the shopping centre, and from the outside it looks like a tiny doorway. Once inside I was greeted by the front of house, and shown upstairs to a beautiful waiting area overlooking the rest of the salon. I had a chance to sit there and relax and people watch while I waited for my appointment. The salon itself is absolutely beautiful. Everything is black and white, and it feels very sleek and glamourous. The hairdressing stations looked like how I wish my own dressing table did, with big mirrors and bunches of pink flowers everywhere. 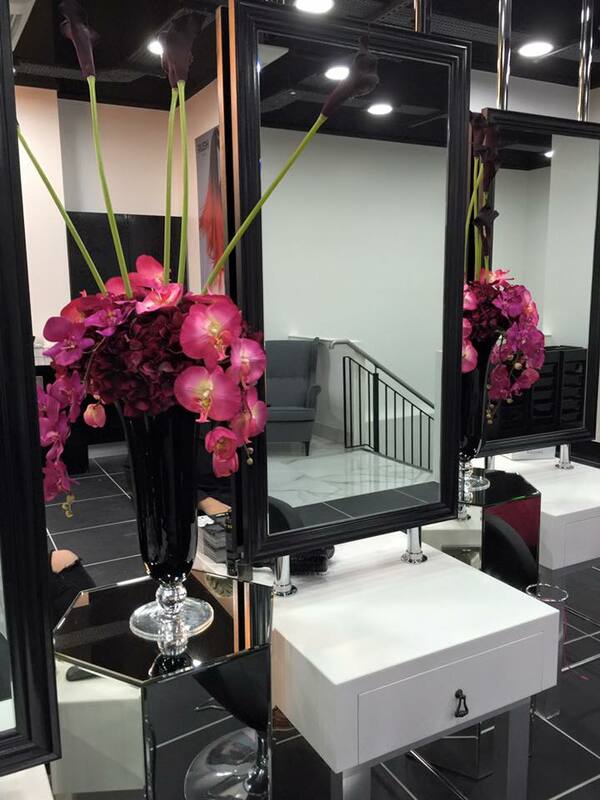 It felt very welcoming and calm, the exact feeling you want to experience in a salon. Once it was time for my appointment I was introduced to Kelly, who sat down with me for a consultation and we talked through what I wanted to do with my hair. Sadly I’m a really boring person, so I went for just a small trim as I’m trying to grow my hair a little. I was then taken to the hair washing station (is that a term?! ), which was a separate section of the salon, a little darker and calmer from the main area. It was such a relaxing space I felt like I could have fallen asleep in there. Afterwards I was led back to the hairdressing station, was given a massive pot of tea, and Kelly started working on my cut and blow dry. Throughout the process Kelly talked to me about what she was doing, and gave me tips on how to keep my hair looking healthy and shiny. Once she was finished I was very happy with my new do, particularly how much body and shine it now had. Something I can say about the whole experience is that it was very quick, but not that it felt like I was being rushed. 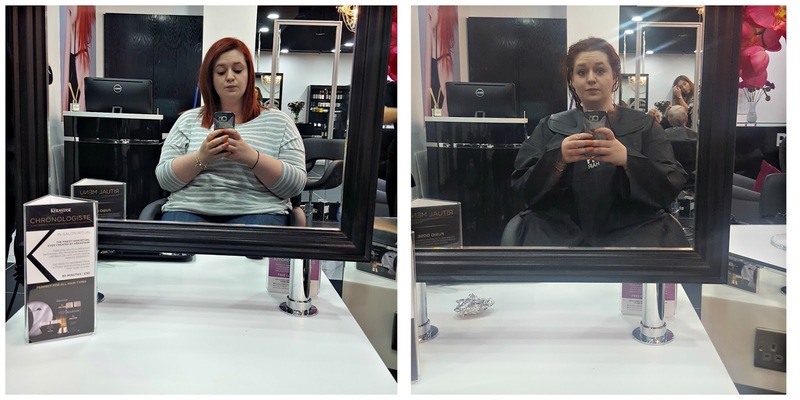 I still felt as if I was getting dedicated attention, but perhaps because I was only in for a cut and blowdry, the whole service was a lot quicker than if say I was in for a full head of colour. I really enjoyed my experience at Rush Hair & Beauty, and I was really impressed with the quality of service I received, I think I’ll definitely be back for a visit next time I’m in MK! I've never been to RUSH but this sounds and looks lovely!